In the heart of the Inca Empire, Aranwa Cusco Boutique Hotel is the essence of luxury and comfort built in a Colonial mansion of the 16th century featuring 43 spacious and radiant guestrooms and suites. Displaying paintings of the Cuzco school, Colonial sculptures, and carvings that transport guests to a time of resplendent extravagance, Aranwa Cusco Boutique Hotel affords cultural insight on the traditions and beauty of the Andes. Situated in the mystical city of Cusco, Aranwa Cusco Boutique Hotel ensures guests a brilliantly majestic Andean experience only rivalled by its rich heritage and gracious hospitality. 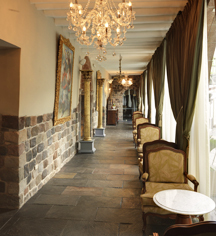 Aranwa Cusco Boutique Hotel, a charter member of Historic Hotels Worldwide since 2012, dates back to 1560. 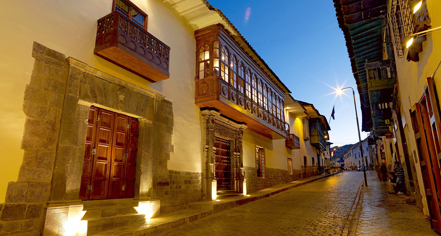 Aranwa Cusco Boutique Hotel is a converted 16th century colonial building that still displays its original stylistic elements including the iconic stone façade. Hotel/Resort Fees & Taxes: The national sales tax (18%) is charged upon check-out to citizens of Peru regardless of length of stay and to foreigners staying in the country for 60 consecutive days or more. Foreigners who present a valid passport and Andean Migration Card (Tarjeta Andina de Migración) at check-in are exempt from this tax. Furthermore, the tax may apply per room when the room is shared by a taxable and a nontaxable guest. In the heart of the Inca Empire, Aranwa Cusco Boutique Hotel is the essence of luxury and comfort built in a Colonial mansion of the 16th century featuring 43 spacious and radiant guestrooms and suites. Learn more about the History of Aranwa Cusco Boutique Hotel .